A rigid and accurate guide designed for easy, single-handed placement. Rigid design with calibrated tip resulting in consistent, accurate guide-wire placement. Broad face of tip easily passes through notch and provides a means of protecting posterior capsule during guide wire drilling. 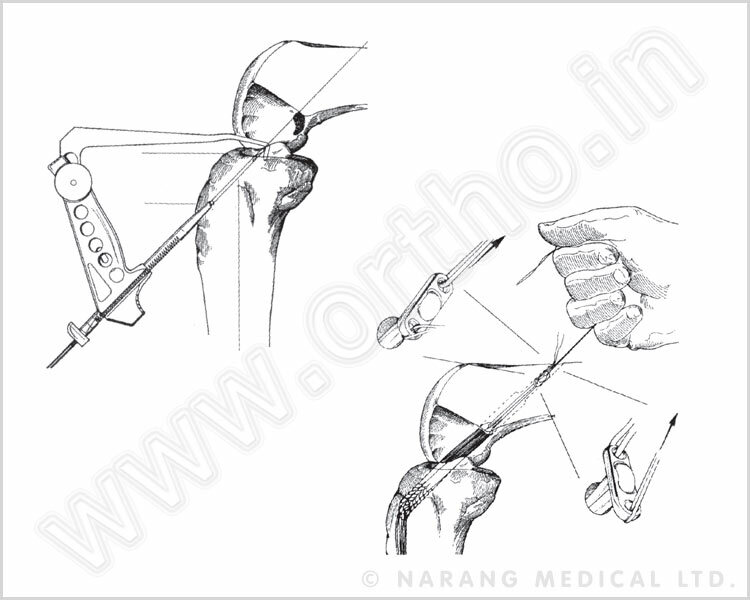 Four sharp points for the bullet helps in securing engagement of the ACL guide at any angle. Accurate reproducible placement and drilling of tibial and femoral tunnels during single incision ACL reconstruction. Works on bone-tendon-bone-and other grafts. ACL elbow aimer used for drilling when the ACL stump is not detached from the tibial end. PCL tibial aimer provides a mean of protecting posterior capsule during guide wire drilling. PCL femoral aimer helps in accurate guide work placement. The hoop tip provides a visual reference for the diameter of the fully rearmed tunnel thus helping avoid tunnel encroachment on the articulated surface.